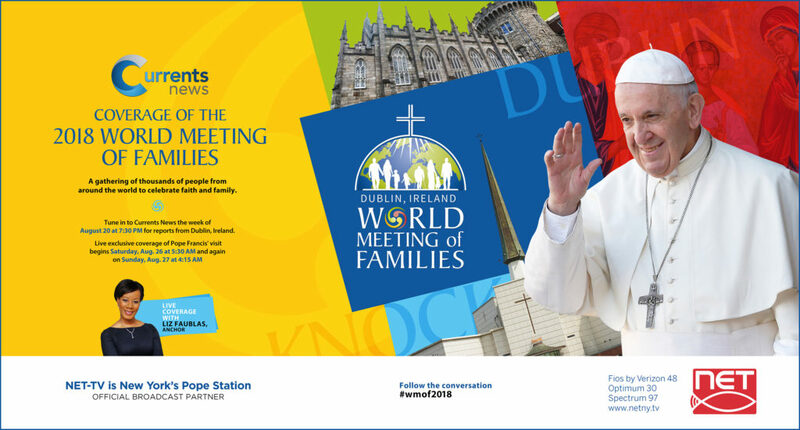 Watch Currents News Aug 20-24 at 7:30 PM EST for exclusive coverage of the World Meeting of Families in Dublin. LIVE coverage of Pope Francis’ visit to the event starts on Saturday, Aug 25 at 5:30 AM EST and Sunday, Aug 26 at 4:15 AM EST. WATCH our programs NOW anywhere, anytime. Currents News‘ Tim Harfmann joins the Diocese of Brooklyn’s School of Evangelization and the Irish Apostolate on their 9-day pilgrimage by Peter’s Way Tour, led by Bishop James Massa and Father Christopher Heanue of Holy Child Jesus Church in Richmond Hill, Queens, to the “Emerald Isle.” Tim will be reporting throughout the week from Galway, Connemara, Knock, The Cliffs of Moher, Conmacnoise, and Dublin. August 20 (Day One): Coverage begins at 7:30 PM as Ireland prepares for the World Meeting of Families and the arrival of Pope Francis. August 21 (Day Two): Currents News brings you exclusive interviews and highlights of the Opening Ceremonies. August 22 (Day Three): Focuses on Family and Faith, exploring topics like supporting families coping with addiction, the vocation of the business leader, and sacramental marriage as a path to joy. August 23 (Day Four): Focuses on Family and Love, exploring topics like the role of grandparents, supporting newly-married couples in the parish, and the joys and challenges of parenting today. August 24 (Day Five): Focuses on Family and Hope, exploring topics like safeguarding children and vulnerable adults, supporting families through the heartbreak of divorce, and finding time for prayer in a digital age. August 25 (Day Six): LIVE COVERAGE BEGINS AT 5:30 AM WITH THE POPE’s ARRIVAL IN DUBLIN. In the evening, enjoy Festival of Families, a celebration of family life with song, dance, and testimonies. August 26 (Day Seven): LIVE COVERAGE CONTINUES FROM 4:30 AM, in which Pope Francis will visit the Apparition Chapel at the Knock Shrine and conclude with Final Mass.